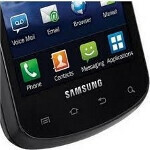 Verizon's first side sliding smartphone to offer 4G connectivity, the Samsung Stratosphere, is seemingly closer to launch than thought. With the specs released and pictures of the device revealed, the only items left to find out about are the pricing of the unit and the exact launch date. 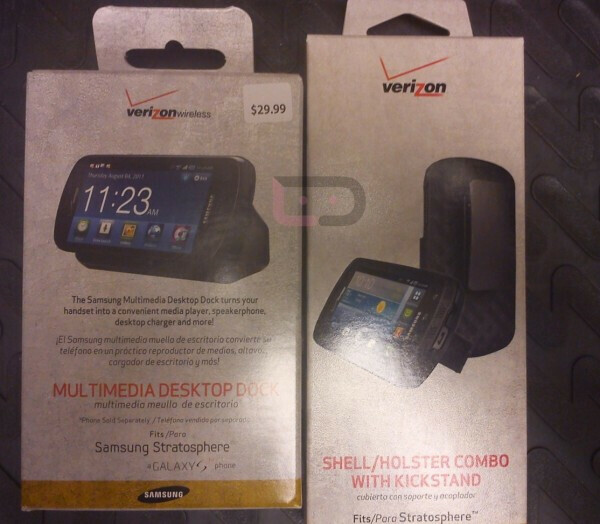 With accessories for the phone now arriving at Verizon stores, we could see a launch as early as this coming week. Two accessories have been photographed for the Samsung Stratosphere. One is a desktop dock that turns the phone into a media player, speakerphone, alarm clock and charges up the handset right from the dock. The other accessory is a shell design combination holster/kickstand that lets you prop up your phone for an optimal viewing angle. Verizon considers the Samsung Stratosphere to be a mid-range LTE phone, which means that those of you on Verizon who want 4G speeds without paying an arm and a leg for an LTE enabled phone, might be on the verge of getting a golden opportunity to pick up a the speed you want at a price you don't mind paying. No one cares about this phone. You mean no smartphone fanatics like us dont care about this phone. Average people should love this phone. Still a good phone, just not dual-core. I actualy can name 20 people in my personal life that are planning on getting this phone. No one cares about those people. True. Their money isn't worth as much as yours. Verizon does ;) Nice looking phone that will appeal to a broad group of peoples! By "outdated", of course, you mean "affordable". I was excited for this. But you seriously have to be joking about the specs. It's just a Fascinate with a keyboard. And I bet it'll be $$$. You could atleast put more RAM, overclock to 1.2ghz, and put an 8mp in. Sheesh. Why do all that? It's meant to be a mid-range phone and I have a fascinate. It runs flawlessly. Seriously, if PA posters had it their way, no phone would cost less than $200. Come on, the mid-range is so 2010. Have any of you played with an LTE enabled phone. It is really fast. For instance today on my iPhone I was watching a YouTube video and it kept catching up to the poit where it was downloaded so it kept pausing I had to just keep it paused so the video could download to my cache so I colt view it. With the 4g LTE it don't need to it's blazing fast. So on one hand yeah it is out dated but it will end up being free very soon with contract barre tee and it's really not that bad of a phone. Considering most apps and such are not optimized for duel core yet this phone will still be useful for atliest another year. Even though by than there will be quad core phones out. I personally am getting the iPhone five if it has LTE which it won't probably or getting either the droid bionic or samsung nexus prime or what ever it's going to be called. Also about this phone I bet it is being made out of allot of the extra parts left over from the fascinate. hmm i guess dev support for epic/stratosphere. is there any difference between the two hardware wise? Minimal differences from the looks of it. The keyboard is slightly revised and looks like an expanded Samsung Rogue layout to me. It was also reported with a larger 1800 mAh battery, which if true should help in dealing with the LTE burden. Heh... the desktop dock even confirms this will have Galaxy S branding.